We present a new method for synthesizing high-resolution photo-realistic images from semantic label maps using conditional generative adversarial networks (conditional GANs). 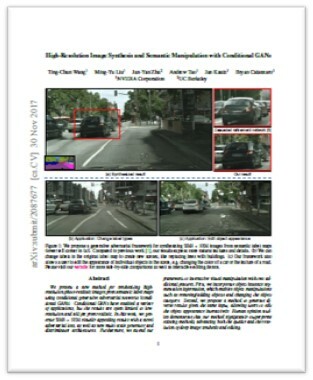 Conditional GANs have enabled a variety of applications, but the results are often limited to low-resolution and still far from realistic. In this work, we generate 2048x1024 visually appealing results with a novel adversarial loss, as well as new multi-scale generator and discriminator architectures. Furthermore, we extend our framework to interactive visual manipulation with two additional features. First, we incorporate object instance segmentation information, which enables object manipulations such as removing/adding objects and changing the object category. Second, we propose a method to generate diverse results given the same input, allowing users to edit the object appearance interactively. 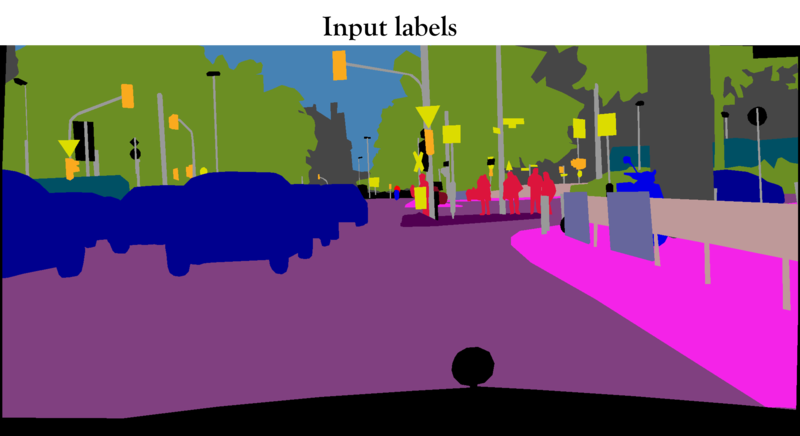 Human opinion studies demonstrate that our method significantly outperforms existing methods, advancing both the quality and the resolution of deep image synthesis and editing. We thank Taesung Park, Phillip Isola, Tinghui Zhou, Richard Zhang, Rafael Valle and Alexei A. Efros for helpful comments. We also thank Chen and Koltun and Isola et al. for sharing their code. JYZ is supported by a Facebook graduate fellowship.